Charlie Shaub was born on July 31, 1935, in Portland, Tennessee. He enlisted in the U.S. Air Force on March 4, 1954, and after completing basic training at Lackland AFB, Texas, he was trained as an Air Passenger Specialist. His first assignment was with the 1501st Air Terminal Squadron at Travis AFB, California, from September to November 1954, then with the 1503rd Air Terminal Squadron at Tokyo International Airport, Japan, from November 1954 to November 1956, and back with the 1501st at Travis from November 1956 to March 1957. His next assignment was as a Flight Traffic Specialist with the 75th Air Transport Squadron at Travis AFB from April 1957 until he left active duty on November 4, 1957. Sgt Shaub returned to active duty in the Air Force on April 10, 1958, and then served as a Dispatcher with the 1608th Air Terminal Squadron at Charleston AFB, South Carolina, from April to June 1958, followed by service as a Flight Traffic Specialist with the 76th Air Transportation Squadron at Charleston AFB from June 1958 to August 1962. He attended Aircraft Loadmaster School from August to November 1962, and then served as an Aircraft Loadmaster with the 76th Air Transportation Squadron (later redesignated the 76th Military Airlift Squadron) at Charleston from November 1962 to July 1966. Sgt Shaub next served as a loadmaster with the 29th Military Airlift Squadron and 438th Military Airlift Wing at McGuire AFB, New Jersey, from July 1966 to June 1967, followed by service with the 4408th Combat Crew Training School at Eglin AFB, Florida, from June 1967 to January 1968. His next assignment was as a C-130 loadmaster with the 776th Tactical Airlift Squadron at Ching Chuan Kang AB, Taiwan, from January 1968 to November 1969, and then back with the 76th Military Airlift Squadron at Charleston AFB from November 1969 to November 1970. 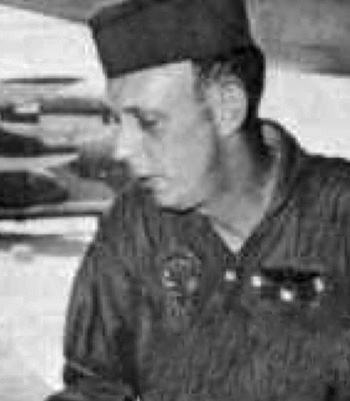 Sgt Shaub returned to the 776th Tactical Airlift Squadron on Taiwan from November 1970 to November 1973, and then served as a Loadmaster Flight Examiner with Headquarters 13th Air Force at Clark AB in the Philippines from November 1973 to May 1974. His final assignment was as a C-130 loadmaster with the 776th Tactical Airlift Squadron at Clark AB from May 1974 until his retirement from the Air Force on July 1, 1976. Charlie Shaub died on March 24, 1997, and was buried at the Old Halltown Cemetery in Hall Town, Tennessee. The President of the United States of America, authorized by Section 8742, Title 10, United States Code, awards the Air Force Cross to Staff Sergeant Charles L. Shaub for extraordinary heroism in military operations against an opposing armed force as a C-130E Loadmaster for the 776th Tactical Airlift Squadron at An Loc, Republic of Vietnam, on 15 April 1972. On that date, while accomplishing a tactical emergency low level airdrop of critically needed ammunition to a besieged concentration of allied forces, Sergeant Shaub's aircraft was severely damaged by hostile anti-aircraft fire. The high explosive cargo was ignited, starting an intense fuselage fire. Realizing the immediate danger to the aircraft and crew, Sergeant Shaub risked his own life to jettison the burning cargo seconds before it exploded and to extinguish a raging fuselage fire, sustaining severe burns on his face, neck and hands in the process. By these actions, Sergeant Shaub saved the lives of four fellow crew members and prevented the loss of his aircraft. Through his extraordinary heroism, superb airmanship, and aggressiveness in the face of the enemy, Sergeant Shaub reflected the highest credit upon himself and the United States Air Force.